This is a wonderful new post from Chef Brian Sterner. A few months back I was asked to work on a project for West Yellowstone. Delaware North was in the midst of renovating one of the restaurants at the Holiday Inn there. I was asked by Christian DeVos to work on the menu concept by developing dishes and recipes and then following that up with a couple trips to work on training the crew. At first I thought, absolutely, what a great opportunity. This thought was quickly followed by…”Oh no, what do I know about the Midwest?” You see, I grew up in Buffalo, NY, the home of chicken wings and cold beer (Canadian) and of course snow. I quickly hit the books and Internet to research what that area is known for, all to find out, SNOW; along with Big Skies and an abundance of Buffalo. Oh, and let’s not forget Huckleberries… The concept we were working on was to be our take on “Open Range” Cuisine. A lot of time was spent focusing on good down-home cooking along the trail. Meatloaf, Trout, Johnny Cakes, Pilot Bread, Bison Pot Roast and Big Cuts of Meat quickly made their way onto the menu. It’s amazing how a culinary journey can start in Buffalo (New York) and continue with serving Buffalo from Montana…. A big thanks goes to Chef Henin and Delaware North for the continued opportunities… I am looking forward to the next culinary adventure! This entry was posted on Friday, June 24th, 2011 at 11:52 am and is filed under Uncategorized. You can follow any responses to this entry through the RSS 2.0 feed. You can leave a response, or trackback from your own site. One Response to From Buffalo to Buffalo…. Great article! I worked with bison, huckleberries, Johnny cakes, et al. 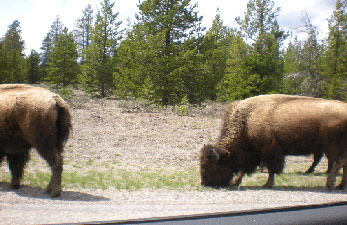 when I spent a couple months at St. Mary, Montana in 2006 (when DNC took over management of the resort there), and I still use buffalo in many dishes at home today.